When I made my second trip to New York City this past month I had all the grand intentions to shoot photography until I broke. I was going to be up pre-dawn and shooting photos until well after dark. Well, it didn’t happen. As usual, a string of amazing events in my life was followed by a string of bad luck. I flew from Santo Domingo to New York only to arrive to find out that during my flight my website, and my magazine’s website, had been hacked by malware. If that wasn’t bad enough my computer was chewed up in the process too, and spent 4 days with the Geek Squad. I ended up spending the better part of my time in the city, and all of my funds, trying to get everything sorted, but thankfully I did. However, I told myself I was not going to leave New York City until I got a proper photo of the Statue of Liberty. I had just acquired some new toys (part of the series of good things), including a 200mm f/2.8 lens and a 2x extender. I was keen to test out the equipment and I thought that a photo of the statue of liberty from across the river would put the new gear to the test. I was right. Anyways, enough chatter, this is one of my favourite photos of late not only because of the amazing sky, but because of the practice of new skills and new equipment to get it. As I eluded to in the preview, I got this photo of the Statue of Liberty using my new 200mm f/2.8 lens and a 2x extender. I shot the image from South Cove Park which might look like one of the worst places in the city to shoot since it looks out to New Jersey, however, I also got a great line at the Statue of Liberty. Placing a 2x extender, for those who don’t know, on a 200mm f/2.8 lens essentially turns it into a 400mm f/5.6 lens and gives a whole lot of range. I wouldn’t have been able to get this shot without it. 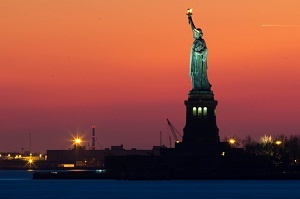 The technical info for the photo of the Statue of Liberty is as follows: 400mm, f/16, 20 seconds, 100 ISO. Beautiful sky in this photo! And I like that NJ is in the background…makes it more real. I’m glad to hear that you got new camera equipment. I can relate to the hacking. That happened to my site just 2 weeks ago. Sorry to hear about the hacking Jenna! 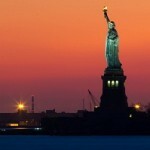 Thanks for the compliment on the Statue of Liberty photo… I’ve been trying to get a shot like that since I first saw it! Awesome shot, fantastic sky colour. Is that a 200mm prime lens you now have? Also really like how you’ve incorporated your photography signature into the image. Thanks Sam, yes the lens is a 200mm fixed f/2.8 prime. It takes some very crisp images! I always thought that South Cove would be a great place to shoot The Statue of Liberty – great work! Thanks Savvy! I’m sure there are lots of great angles to take photos of the statue of liberty from! Great shot with great view! Trying something different really works sometimes. Thanks Rashmi – I was really pleased with how this photo of the statue of the statue of liberty turned out. New York is an inspiration to us all for photography and painting. Great shot here too, the colours are unusual and eye grabbing.